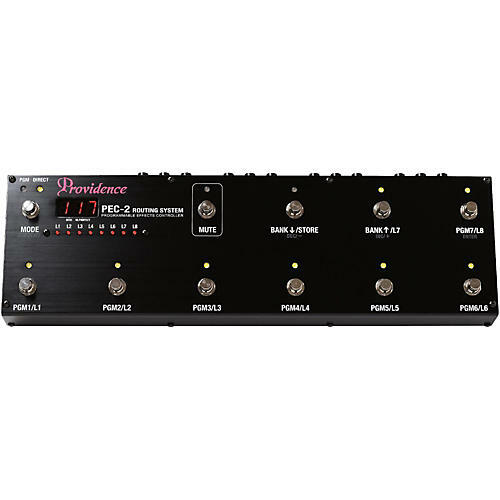 The PEC-2 Programmable Effects controller gives you the power and flexibility to have virtually any pedal combination at your feet and eliminates the needs to tap dance in the middle of your performance. Loops 1 through 5 are connected in series. When a loop is OFF the corresponding SEND output is muted so that no signal is sent to the connected effect unit. This eliminates the possibility of unwanted oscillation due to crosstalk when high-gain effects are used. All loops are S.C.T (Single Contact True-bypass) type circuits, so when a loop is bypassed the signal passes through only a single relay circuit for maximum reliability as well as maximum sound quality. Loops 6 through 8 are independent. The loop 6 through 8 SEND jacks can also be used as latching N.C. (Normally Closed) switches, and the loop 6 through 8 OUT jacks can be used as latching N.O. (Normally Open) switches for remote amplifier channel switching. Even the ground lines are independent, so you can use these loops as control switches for multiple devices without having to worry about ground loop problems. The separate loops can be used as mute loops, A/B switchers, and for many other utility functions. When the five series loops aren't enough for your system, you can patch the separate loop IN and OUT jacks together to provide up to eight series loops. Two of the separate loops can be used together as a stereo loop. MIDI IN and OUT/THRU connectors are provided to allow MIDI communication with external equipment. The PEC-2 can also be used as a MIDI pedal. MIDI control change numbers can be assigned to the switches as required, allowing the PEC-2 to be used in a wide range of MIDI-based systems. When two PEC-2 units are connected in the link mode, the MIDI IN and OUT/THRU connectors of both units can be used. ※When one PEC-2 unit is being used with a second PEC-2 in the remote mode, only the MIDI IN and OUT/THRU connectors of the MASTER unit are available for use. The SLAVE unit MIDI connectors are not operational. The PEC-2 mute circuit is located immediately before OUT-1 and OUT-2. The MUTE switch can function independently, without being affected by the recalled program. Two mute disengage modes are provided: Manual, in which mute is manually disengaged via the MUTE switch, and Automatic, in which mute will also be disengaged whenever a program switch is pressed. The PEC-2 has 84 independent memory locations (7 programs x 12 banks). A memory protect function is provided to prevent accidental changes to the memory contents. Link Mode: Two PEC-2 units can be linked to function as an effect controller that will handle up to 16 loops. When the PGM mode is selected, recalling a program on either unit will recall the same program on the second unit as well. In the DIRECT mode the loops on either unit can be directly turned on or off as required. Remote Mode: One PEC-2 unit can be located on stage while another is in the wings, and one or the other can be used as a "remote control unit". One unit is designated as the"master"and the other as the"slave", and the settings memorized in the master unit are recalled. The PEC-2 buffer is a proven design that delivers superior performance in a range of Providence Custom Products. A high-performance 15-volt DC power supply ensures broad dynamic range. Although the signal level isn't affected, the buffer "fortifies" the relatively weak guitar or bass signal so that it is less susceptible to degradation. Separate buffered and non-buffered inputs and outputs are provided so that fuzz units and other effects that might exhibit a change in tone if connected after the buffer can be connected before the buffer circuit. The signal received via the buffered input or non-buffered input is always available at this output for connection to an electronic tuner. The tuner output is buffer-isolated from the main signal chain so that a short in the tuner cable or a malfunction in the tuner itself won't affect the main signal. The power adaptor supplies twice the required power, and will maintain stable operation even if the mains supply drops to approximately 80% of it's rated voltage. Heat generation is effectively minimized, ensuring stable operation even in relatively hot environments. MIDI program change and control change numbers cannot be simultaneously transmitted from the MIDI OUT connector.